As mentioned, many accidents occur because of costumes children wear, especially if the costume is too large for them. In fact, as many as 1 in 4 kids get hurt while trick-or-treating. If they struggle to avoid tripping and falling when walking around the house, imagine how much trouble they’re going to have outside in the dark. If they’re costumes involve masks, try to get them to opt for face paint instead. Not only is it a safer alternative to masks which can reduce visibility, but it’s a chance to create a look that’s truly unique to their costume! If they’re costume is particularly dark, buy reflective tape to place on their arms, legs or candy bag or container. This will make them more visible to cars driving around at night. Trim extra fabric that may be causing them to trip and make sure they’re wearing comfortable walking shoes. 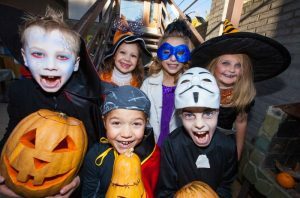 Planning a route for trick-or-treating is a great way to know where your child’s general location is at all times. This is especially important if they don’t have a dedicated cell phone to use. As a general rule of thumb, all trick-or-treaters younger than 12 years of age should have an adult present in case of emergencies. Those who are 12 or older should always have at least one other person with them. A group is always more ideal, which reduces the risk of separation later. If they get lost, make sure they have a tag listing their home address and phone number. When your child is walking from house to house, make sure they’re doing everything they can to take sidewalks to get around. They shouldn’t be cutting across lawns or walking through alleyways where there is far less visibility. Tell them to always walk, not run, as this can easily result in falling and breaking a tooth, putting an abrupt end to an otherwise fun night. Finally, DO NOT under any circumstances let your child run across the street. Only take crosswalks where you can and do not assume vehicles will stop. For this reason alone, you may even want to trick-or-treat earlier in the night while it’s still bright out.